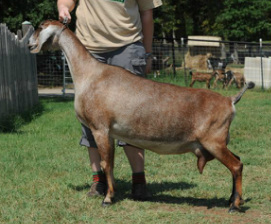 Diana is one of two doelings that were born in 2013 from AI's to +*B SGCH Wingwood Farms TS Timothy. Needless to say she was a keeper before she was even born and we have not been disappointed so far. She has been shown twice as a junior and was Reserve Junior Champion both times in large classes (26 &27). ​She has a lovely mammary as a first freshener in 2015, and is maturing nicely into 2016 as a second freshener. She has milked through very nicely in 2019 and is bred to Honor for 2019 kids. ​In addition, her brother Dexter is working hard in our herd and has two legs toward his permanent CH.